Heat transfer from one media to another, or from one fluid to another, is determined by several basic rules. 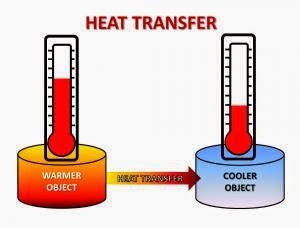 Heat will always be transferred from a hot to a cold. A temperature difference between the process media must always exist. The heat lost by the hot process is equal to the amount of heat gained by the cold process, less any losses to the atmosphere. Heat exchangers continually transfer heat from one process medium to another. There are two main types of heat exchangers. Direct heat exchangers, where both process media are in direct contact with each other, without the process media being mixed together, such as with air and water. A cooling tower is a good example of this type of heat exchanger. Indirect heat exchangers, where each process media are separated by a physical barrier (pipe, tube, or vessel) through which heat must be transferred. Heat is transferred via three methods - radiation, conduction and convection. Radiation – heat is transferred by electromagnetic waves. An example is how your toaster works - the heat is transferred from those orange-red wires to the bread via radiation. 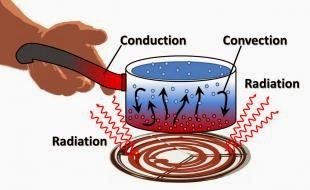 Conduction – heat is transferred through touching or contact of solids or fluids. An example is an electric stove-top element that heats up a pot resting directly on top of it. Convection – heat is transferred by mixing one process media with another. An example is your home furnace where air is heated by circulating through hot tubes.